· Around 54 percent of DSF and 59 percent of ASF homes were under contract in 7 days or less. Signs – such as extended time on market, reduced showing and price reductions – indicate that the market may be entering the retraction phase a bit earlier than previous years. While 59 percent of homes sold in June were at or above asking price, this is down from around 70 percent the previous month and 68 percent a year ago. In addition, more than 50 percent of homes on the market for 15 days or more are electing to make a price reduction, and this percentage is expected to rise as we head into late summer/early fall. 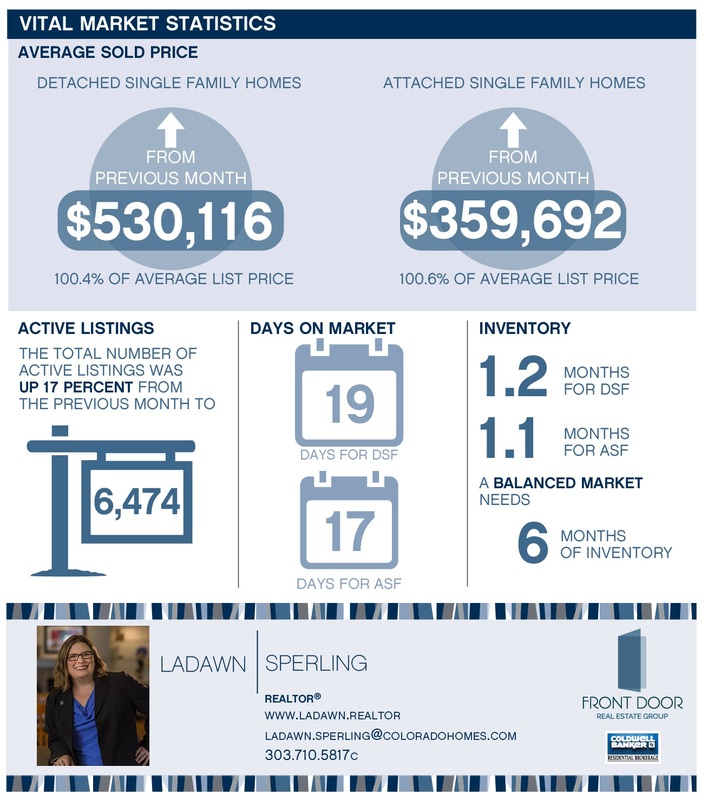 If you need any advice or assistance navigating our real estate market, contact me today at 303.710.5817 or ladawn.sperling@coloradohomes.com. I am never too busy for your referrals. This update is based on information from REColorado®, Inc. provided by Land Title for the period of June 1, 2018, through June 30, 2018, for Adams, Arapahoe, Broomfield, Denver, Douglas, Elbert and Jefferson Counties. Note: This representation is based in whole or in part on content supplied by REColorado®, Inc. REColorado®, Inc. does not guarantee nor is in any way responsible for its accuracy. Content maintained by REColorado®, Inc. may not reflect all real estate activity in the market.